Run the official Gremlin Docker container and attack the host or neighboring containers. $ sudo add-apt-repository "deb [arch=amd64] https://download.docker.com/linux/ubuntu $(lsb_release -cs) stable"
Htop is an interactive process viewer for UNIX. We’ll use it to monitor the progress of our attacks. $ sudo docker build -t htop . To exit htop, enter q. Next we will create an NGINX container and monitor it directly by joining the container’s pid namespace. The Gremlin daemon (gremlind) connects to the Gremlin backend and waits for attack orders from you. 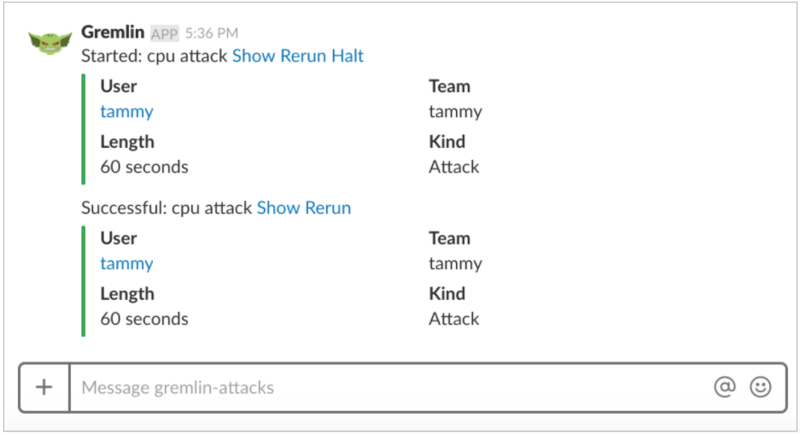 When it receives attack orders, it uses the CLI (gremlin) to run the attack. To connect gremlind to the Gremlin backend, you need your client credentials. (This is NOT the same as the email/password credentials you use to access the Gremlin Web App.) Read the Gremlin Docs to see how to find your client credentials in the Gremlin Web App. $ export GREMLIN_TEAM_CERTIFICATE_OR_FILE="<YOUR_PEM_ENCODED_TEAM_CERTIFICATE or PATH_TO_FILE>"
$ export GREMLIN_TEAM_PRIVATE_KEY_OR_FILE="<YOUR_PEM_ENCODED_TEAM_PRIVATE_KEY or PATH_TO_FILE>"
That’s enough configuration for this tutorial, but feel free to read about other configuration options in the Gremlin Docs. Make sure to pass in the three environment variables you set in Step 4. If you don’t, the Gremlin daemon cannot connect to the Gremlin backend. time_travel # An attack which changes the system time. We will use the Gremlin CLI attack command to create a CPU attack. In this step we will run gremlin attack-container to target the NGINX container by its ID and run a CPU attack against it. The attack will hog one CPU core for 60 seconds. You’ve installed Gremlin in a Docker container and validated that Gremlin works by running the “Hello World” of Chaos Engineering, the CPU Resource attack. You have run a CPU resource attack from a Gremlin container against its host. You have also run a CPU attack and a Blackhole attack from a Gremlin container against an NGINX container. Gremlin can run other kinds of attacks, like State and Network attacks. Try running some! Check out the Gremlin Blog for more ideas on how to do Chaos Engineering on your application infrastructure.